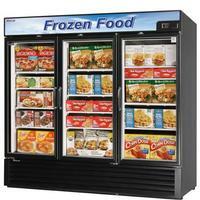 • Alarms that sound when doors are not sealed shut protect against food spoilage that originates from cold air leaks. • Smart defrost system will defrost as needed. High-density polyurethane insulation - The entire cabinet structure is foamed-in-place using high density, CFC free polyurethane insulation. Ergonomically designed doors - Customers’ fatigue fades away with easy grip handles and doors that open effortlessly. These features along with self-closing doors make this the ultimate choice in customer convenience.